Cade and I agree that cheese and carbs are two of the greatest things. Turn it into a Spicy Queso Pasta Primavera and you will never make another meal. Oh how we love fresh veggies thrown into a dish. I know you’re going to think that it’s because it makes it healthier, and I promise that’s a piece of it, but the truth is, it makes us feel like we are eating something healthy no matter what it really is. I mean, Spicy Queso Pasta Primavera isn’t the worst thing you could eat, but it isn’t like you’re having kale for heaven’s sake! It will totally make you happier than kale too. A 2 minute spicy queso sauce is tossed with chewy spaghetti, veggies straight from the market and all topped off with a little salty, melt on your tongue parmesan cheese! 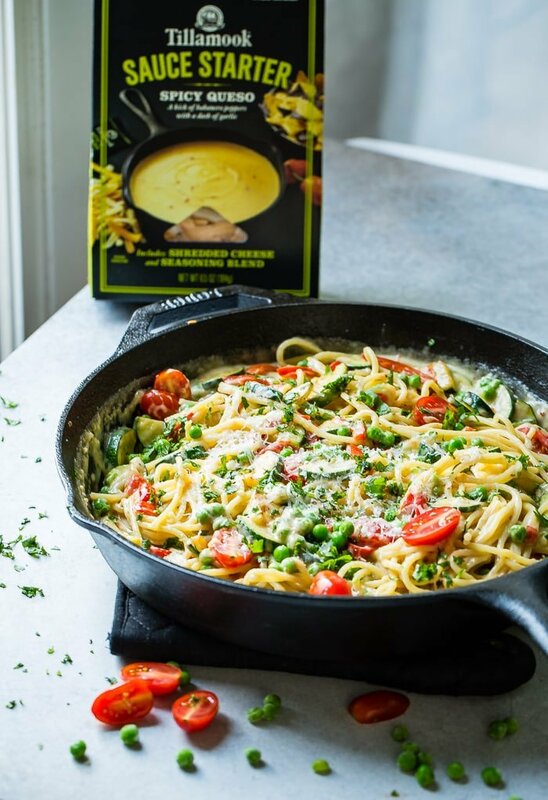 We originally posted this Spicy Queso Pasta Primavera on our Instagram channel in partnership with Tillamook. You know we adore them, it only made sense for us to work with them. But this isn’t a sponsored post. You see, we only had to create the recipe for instagram, but it turned out so delicious, so mouthwateringly delicious, we asked for the go-ahead to post it on our blog. 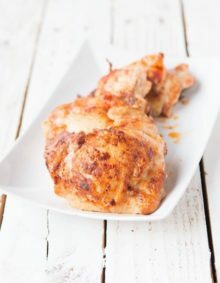 Basically, what I’m saying is, this recipe is awesome and you’d darned better put it on your list for dinner this week. 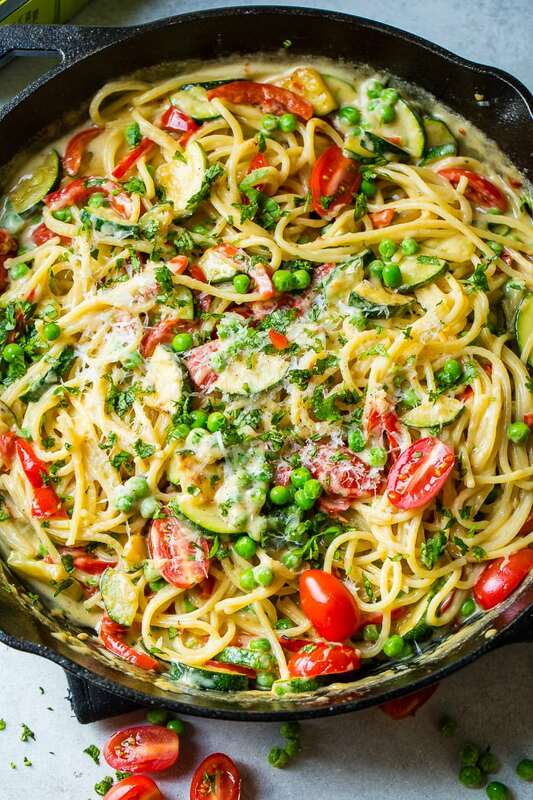 It’s a quick and easy dinner idea recipe using pasta, it’s a healthier dinner idea packed with yummy veggies instead of totally forgetting to make a side dish. 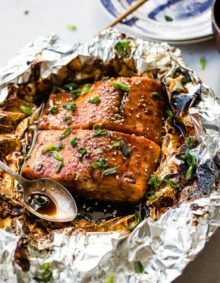 It’s a quick and easy family friendly recipe. That’s a pretty big deal. That’s right, you heard me, our KIDS ate this meal. All of it. When does that ever happen these days?! With a picky 2 1/2 year old and an 8 year old that’s borderline picky, well mealtime can be a real headache. It’s a kid friendly recipe and you can even have the kids make it themselves. At some point, that kid isn’t your’s anymore. They belong to an apartment of college kids, a woman who stands by him, kids who need him. They aren’t your’s. Sure, ultimately they are, but trust me, it won’t be the same. Maybe they won’t ever need to cook a meal, but chances of that are slim. College is cheaper if your child isn’t eating out every meal, plus it’s way more fun for dating and that college life. Don’t forget about that family too. There is actual bonding that happens over food and I imagine you love your kids like we do. 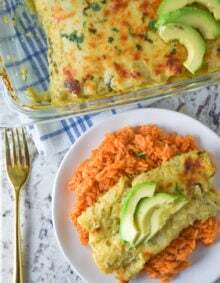 I imagine you want them to be happy and successful, and a large part of that comes from relationships, and how many of you would agree that your special memories are of traditional family recipes in your mom’s kitchen? Every week we let each of our kids pick one meal, and we either work side by side or as they get older, totally turn them over to the food and just stand there for occasional guidance. Let them learn about picking recipes, what’s easy, what’s more work, what’s more expensive. Take them grocery shopping with you. Kids have got to learn about sales, seasonal food, and budgets. Take them to the store where they can pick things out, feel what’s ripe and what’s not, and how to pull together a recipe. One step at a time… Don’t start by teaching children a whole recipe. It’s too much, too overwhelming. Start by teaching them a skill like how to cut veggies, or we usually start with tearing lettuce for a salad or how to cook chicken in a pan. One thing at a time, step by step until they are ready to learn and understand how to do more. Use every sense you’ve got, hearing, seeing, feeling, and tasting. You can smell when oil is starting to burn in a pan, hear the bubbling of a pot and so on. Teach them to use those senses. Taste everything. I mean, not the raw chicken, but the sauce, the pasta, the cooked veggies. 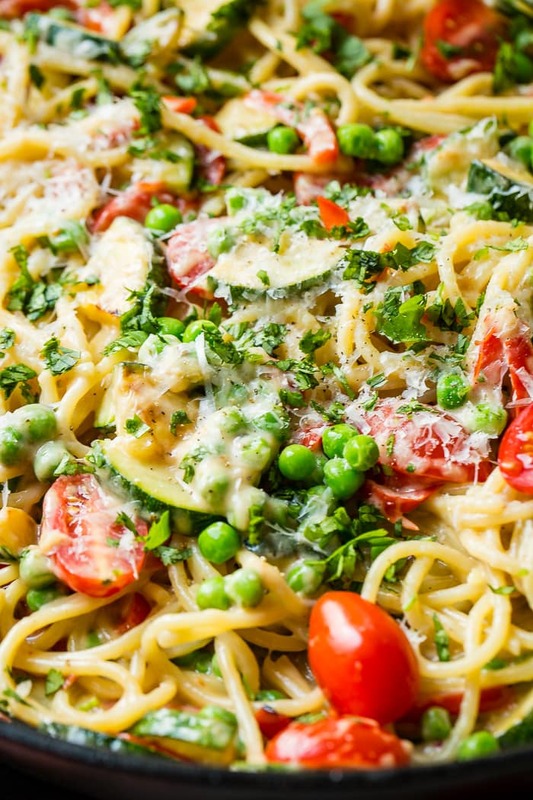 How to make a spicy queso pasta primavera is going to be your favorite thing ever. It takes no time, and no crazy ingredients. Start with your vegetables. That’s always the part of a dish I like to start with. It makes sure that our meals include something healthy. Cook them up and make sure you season them with a little salt. As it’s cooking, prepare the sauce by whisking the cheese, seasoning and milk. That’s it! Just toss it all together, add a little garnish on top and season to taste! Alright, before we get 450 comments, let’s just tackle where to buy Tillamook Spicy Queso Sauce Starter as it’s not as easy to find as the cereal in your grocery store. It’s not hard either, you just have to look in the right place. Head back to the cheese section of your local grocery store and the sauce starters are right there. You may want to check out the locator on Tillamook to see which store to head to. 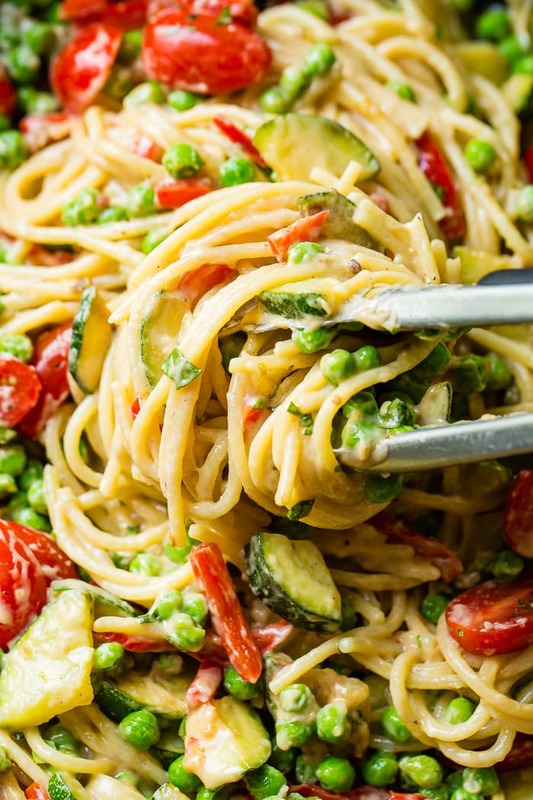 Pasta primavera is a vegetarian dish loaded with fresh veggies so it’s definitely vegetarian, but you can also throw anything in there if you want some meat. Think about a shrimp or chicken addition, yum! Grab whatever you’d like to use, yellow squash, zucchini, peas, tomatoes, corn, beans, asparagus etc. Is Pasta Primavera Served Hot or Cold? 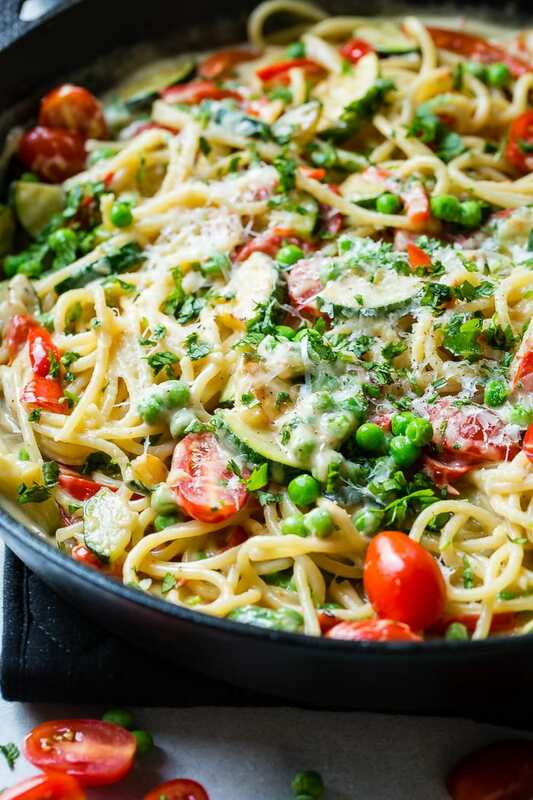 Pasta primavera can be served hot or cold, however in a dish like this Spicy Queso Pasta Primavera where there’s a cheese sauce involved you’ll definitely want to serve it hot. REMEMBER TO SUBSCRIBE TO our FREE Oh Sweet Basil NEWSLETTER AND RECEIVE EASY RECIPES DELIVERED INTO YOUR INBOX EVERY DAY! When you try a recipe, please use the hashtag #ohsweetbasil on INSTAGRAM for a chance to be featured in our stories! FOLLOW OH, SWEET BASIL ON FACEBOOK | INSTAGRAM | PINTEREST | TWITTER FOR ALL OF OUR LATEST CONTENT, RECIPES AND STORIES. Cade and I both agree that cheese and carbs are two of the greatest things ever invented. Turn it into a Spicy Queso Pasta Primavera and you might as well never make another meal. Start a pot of water boiling and salt it well. In a skillet over medium heat, cook the garlic, zucchini and peppers in a drizzle of olive oil. Cook for 3-5 minutes or until slightly charring the zucchini. Remove veggies to a plate. Prepare the spicy queso according to directions. Add the drained spaghetti into the queso along with all veggies, including tomatoes and peas. Toss together and sprinkle with parmesan and cilantro!